Over two thousand mainly young Tamils and their supporters took part in another mass demonstration on Friday. 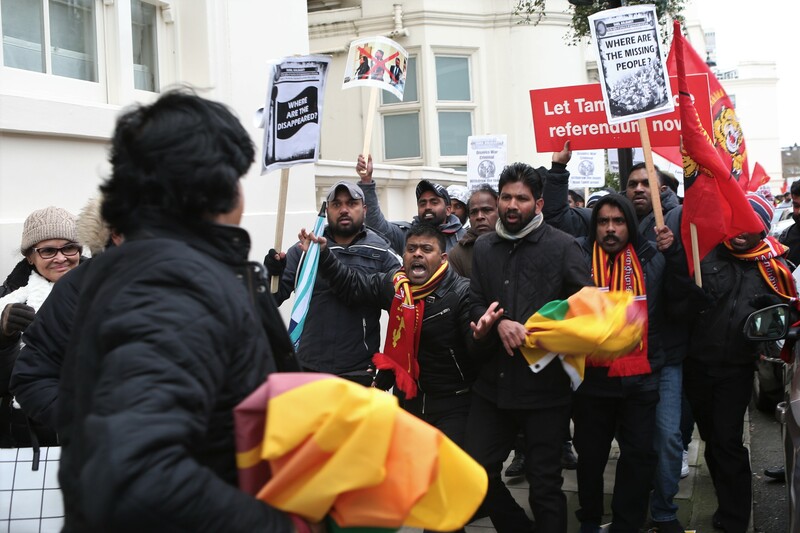 We demanded the immediate dismissal of the Sri Lankan Army officer, Brigadier Priyankara Fernando, for his throat-cutting threat made at peaceful Tamil protesters on 4 February. 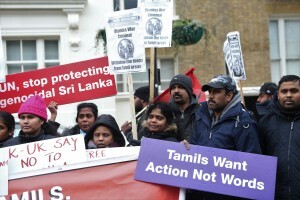 The demo gathered outside Sri Lankan High Commission with banners, placards and slogans calling for immediate action. It then marched all the way to the Foreign and Commonwealth Office – with drums and chants. Solidarity messages and speeches were given outside FCO, including from Brian Debus, Hackney Trades Council, and Helen Pattison, London Socialist Party. Tamil Solidarity placards demanding an end to the land grab, release political prisoners, information on the disappeared, and the right to self-determination stood out. Our leaflets and petition got a great response. 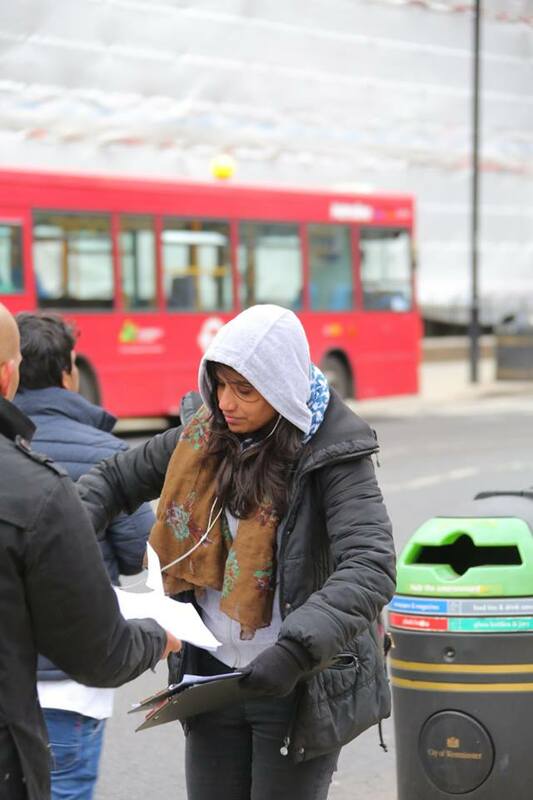 We were the only group doing this, with leaflets in Tamil and English discussing what needs to be done next and how to take the movement forward. The protest yesterday gave a glimpse and a flashback of the mass protests that took place in central London during the 2009 massacre. 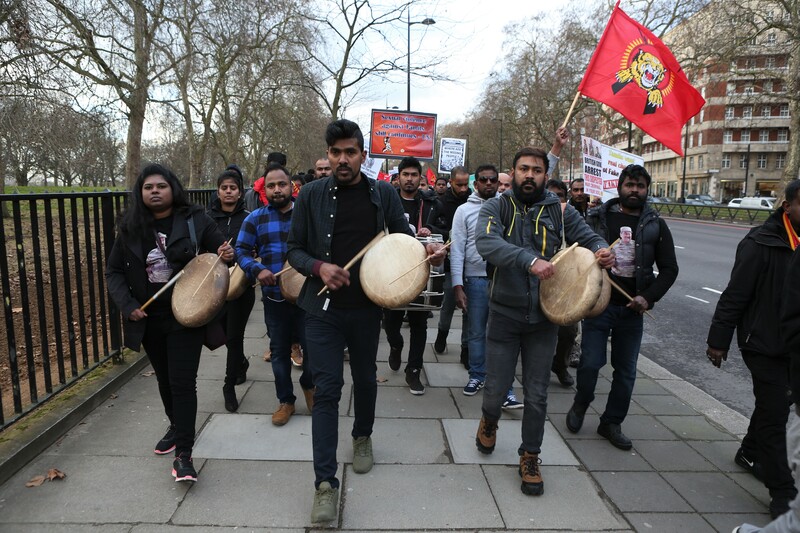 More 100,000 Tamil-speaking people took part in those, but the same level of energy and determination – to fight against oppression and for our rights – was there to be seen. For many youth, including myself, taking part in the 2009 protests was my first political act. However, the strength, energy and determination of the protesters nine years ago have not harvested. Clear leadership and programme were not given by the leading organisations then. 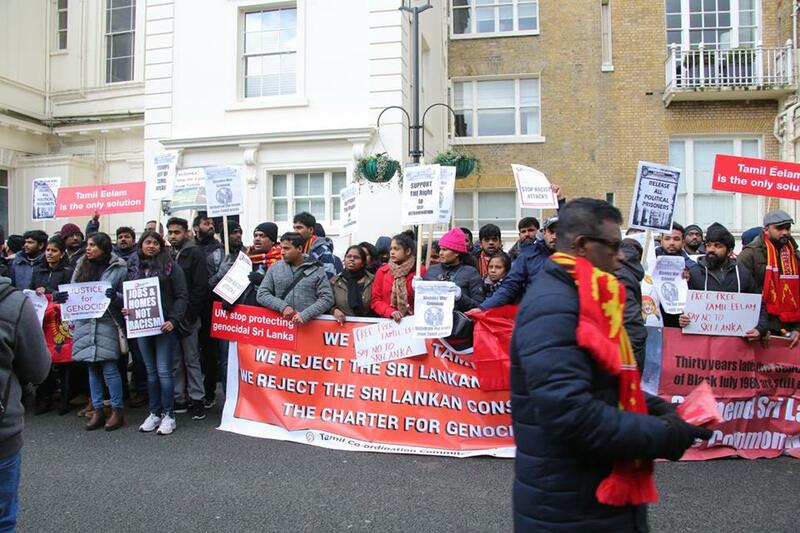 Back in 2009 Tamil Solidarity gave out thousands of leaflets saying that the ‘struggle must continue’ and this was a popular call. Our ideas got an echo but, unfortunately, we didn’t have the ear of the media and we were not in the leadership. Those at the forefront of those protests did not put forward a strategy on how to take the struggle forward. Instead of politicising and mobilising the masses that came out on the street, the strategy of lobbying was introduced. Continuous lobbying of right-wing establishment politicians and yearly visits to the UN has been promoted by the other organisations. Such a mistake cannot be made again. 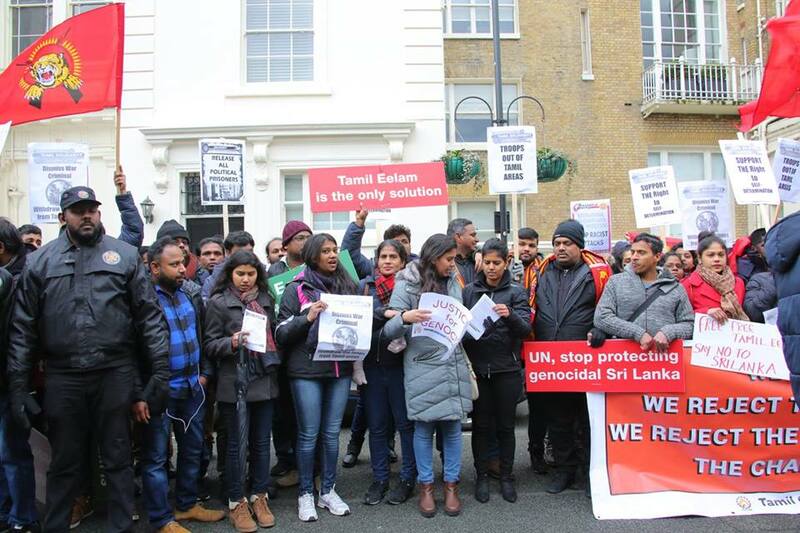 Tamil Solidarity urges all who took part in the protest yesterday to get involved in political discussions. It’s crucial that we arm ourselves with the correct programme on how to win our rights. 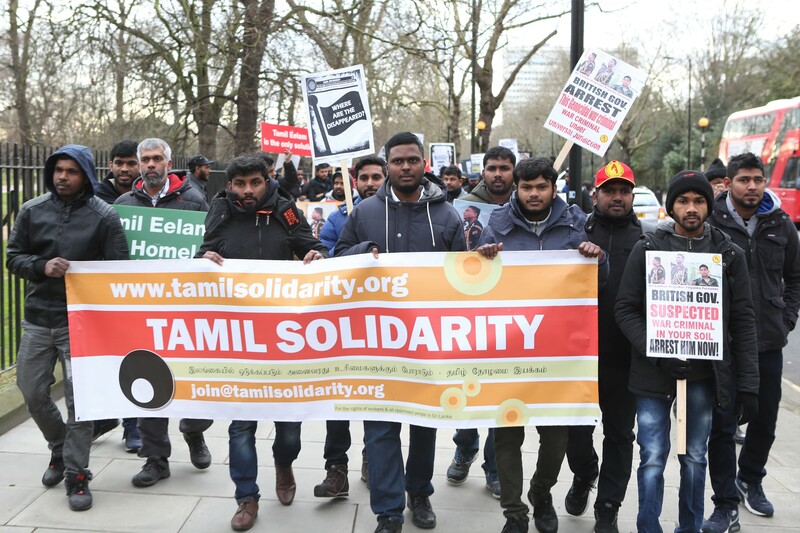 Tamil Solidarity puts forward the need to build a united struggle with other oppressed communities, working class and young people. These are our natural allies – people who will stand with us. Fighting together we can win our rights. If you want to be part of this fight-back, join Tamil Solidarity today! 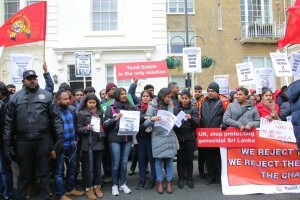 Brigadier Priyankara Fernando’s cut-throat threat at peaceful protesters outside the Sri Lankan High Commission on 4 February has caused mass outrage and has increased the determination of Tamil youth to bring the war criminals to account. Leading Tamil Nadu news media News 7 had over 100,000 views and 4,000 shares of the footage – on the day of the protest alone! Tamil Solidarity’s online petition to complain to the foreign ministry in Sri Lanka and UK have reached over 1,500 signatures. 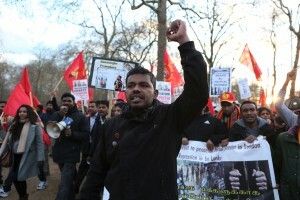 This mass action caused a temporary victory on 6 February when the Sri Lankan foreign ministry suspended Brigadier Fernando. However within a day the Sri Lankan president, after talks with army chiefs, got involved to remove his suspension – causing more outrage. 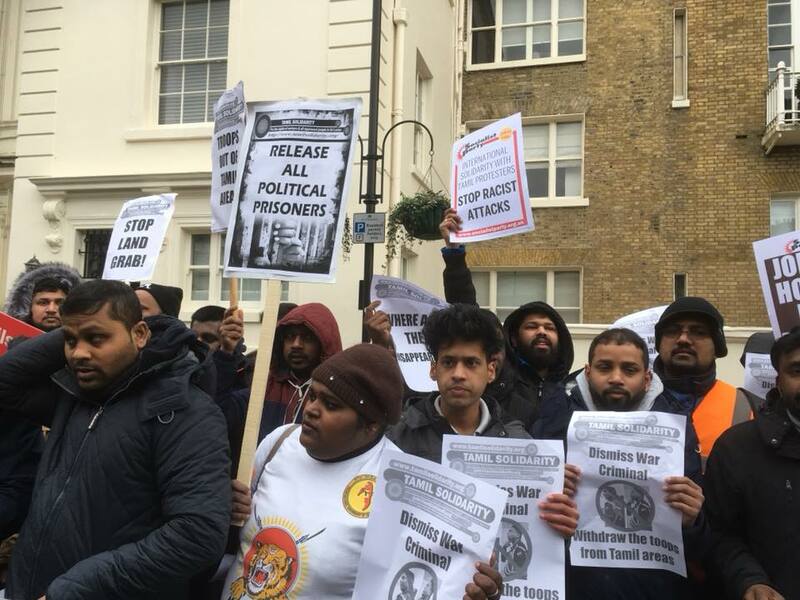 This highlights the hypocrisy of the current government in Sri Lanka confirming that it is following the footsteps of the Rajapaksa regime by ignoring video evidence and not carrying through investigations. We demand the immediate dismissal of Brigadier Fernando from the High Commission staff. But Fernando is not just an individual. He also represents the arrogance and oppressive nature of the Sri Lankan state. 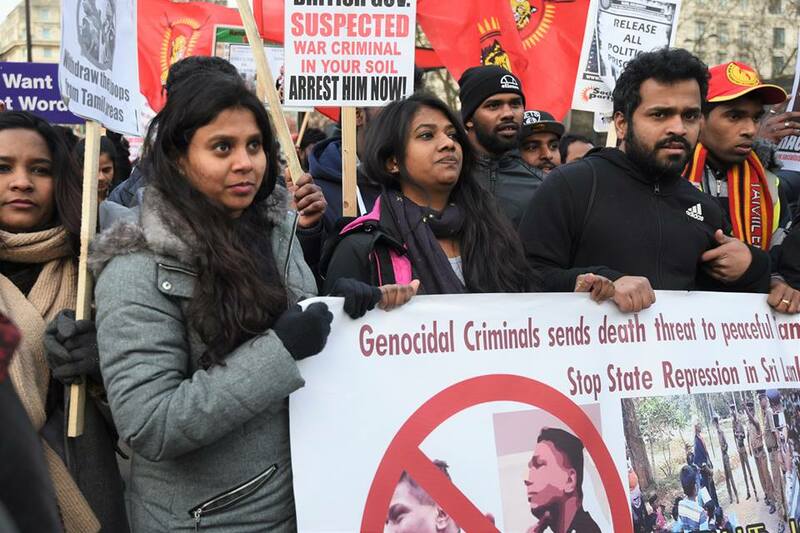 Nine years has passed since the mass slaughter of Tamils and the victims of the war still continue to be denied justice. 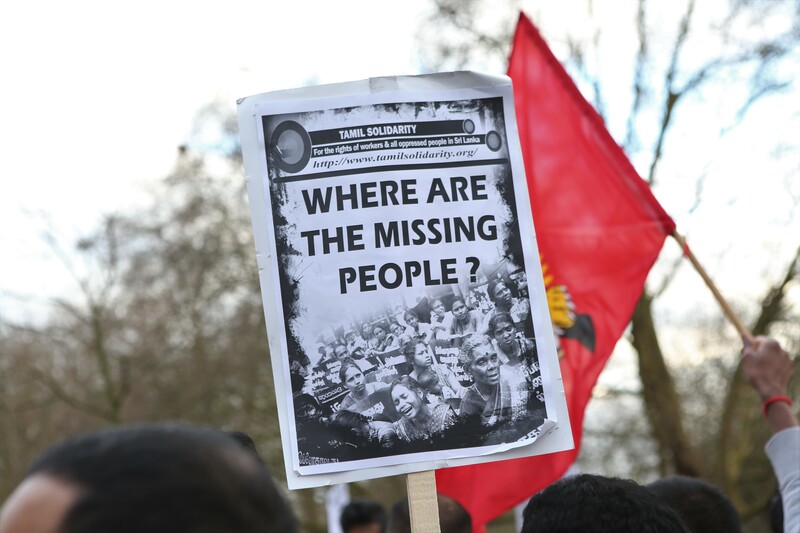 Land grab, military occupation, disappearances and oppression are a daily feature of the lives of those in Sri Lanka. 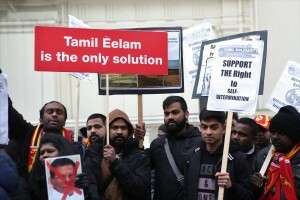 Since 2009 Tamil Solidarity has kept the struggle going. We have always exposed the hypocrisy of the British government – talking about rights while selling arms to the Sri Lankan army and doing big business deals. We have shown up the inaction of the United Nations and other international bodies – passing resolutions for war crimes investigations but doing nothing about it. 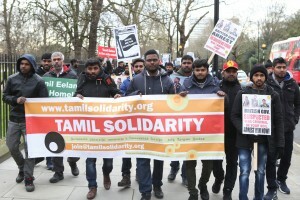 Instead, Tamil Solidarity highlights the need to build a common struggle with our natural allies – oppressed communities, workers’ trade unionists and other activists. It is our united mass strength that can be a powerful force for change. 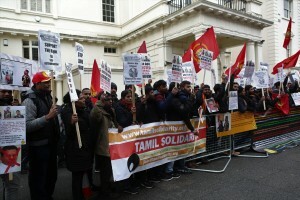 Tamil Solidarity appeals to all those who want to continue the struggle of the Tamil-speaking people to get active. We need to make sure that the anger and determination shown on this protest is organised and built on.